China's economy is booming, and in the West, everyone from President Obama on down is demanding that the Chinese currency be allowed to rise in value. Now, it's possible for small investors in the U.S. to capitalize on this opportunity. The Bank of China's New York Branch announced this week that Americans will now be able to open FDIC-guaranteed accounts in the bank in a way that was never before permitted -- by converting their deposits into the Chinese currency, known officially as the renminbi and colloquially as the yuan. According to the bank's website, account owners can exchange as much as $4,000 worth of renminbi a day, up to a maximum of $20,000 a year. Of course, there isn't much you can do with renminbi in the U.S. beyond putting them under your mattress (and you can't even do that, as at the moment, the bank won't let you take U.S. withdrawals in renminbi). Nor do the accounts pay interest. "The Chinese yuan has just gone in one direction for the past couple of years," says Kathy Lien, who has just published a new book on foreign exchange investing,The Little Book of Currency Trading.Not only is the Chinese economy doing exceptionally well, Lien says, but foreign governments -- led by the United States -- are pressuring Beijing to let its currency float higher in order to offset huge trade imbalances. "I think that pressure is not going to abate any time soon," Lien says, "and the yuan could appreciate another 10% to 15% over the next couple of years. It is something that many investors are looking at." If you don't feel like trekking to New York to open an account at the Bank of China, your options are limited. The renminbi is hard to come by because China uses the most stringent capital controls: The currency is only legally traded within China, in Hong Kong and between specified trading partners such as Shenzen and Malaysia. But there are alternatives. Professional currency traders use something called non-deliverable forwards to match the moves of the renminbi, but Lien says NDFs are only for the most sophisticated institutional investors and hedge funds. She recommends ETFs such as the Wisdom Tree Dreyfus Currency Income ETF (CYB), which invests in short-term securities denominated in renminbi. But the fund's one-year gain is only 0.43%, so investors would have to have some patience. 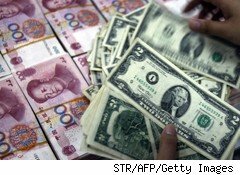 Another possibility: Market Vectors Chinese Renminbi/U.S. dollar exchange traded notes, which are similar to ETFs, but are unsecured debt securities issued by Morgan Stanley to track the S&P Chinese Renminbi Total Return Index. Those are up a whopping 0.4% in the last year. About to Float, or All for Show? But past conditions may not continue to prevail: Investors are counting on China to take the limits off the appreciation of the renminbi that have been in place for the past few years. Between 2005 and 2008, for example, the currency rose 21% against the dollar, then did virtually nothing for two years. Now, China is facing a surge of inflation at home and one way to control that problem would be to allow its currency to rise, meaning that imported goods like food would cost less in local Chinese terms. The Chinese are also keen to see their currency gain international status. "Ideally, they would like to see its status rival that of the euro or the U.S. dollar, but of course that won't happen unless they freely float the currency," Lien says. "But as we get closer to that possibility, central banks around the world have to start buying Chinese yuan in order to boost their reserves of that currency and match trade activities." Of course, the recent opening of the renminbi bank accounts in the U.S. may just be part of the public relations show China is mounting in advance of President Hu Jintao's visit to the White House next week. As Obama presses him to allow the renminbi to climb, Hu can claim that his country is doing everything possible to improve the exchange rate -- including allowing Americans to invest in it's currency more freely.